TIME FOR US is the outstanding vessel in the much loved Delta 37m series. She has benefited from loving and experienced owners who have spared no expense in regular upgrades and maintenance. Having owned one of the finest Feadships ever built the current owners searched the market long and hard for a US built yacht of similar pedigree and soon realized that Delta was the stand out builder of choice. The spacious main salon with dining area is the perfect space for both relaxing and hosting guests. Forward on the main deck is the galley and a VIP cabin featuring large windows that let in huge amounts of natural light. Stepping downstairs there are three beautiful staterooms including a roomy full beam master, with his and her bathrooms. This stunning stateroom is ideally located low and in the center of the yacht for maximum comfort whilst cruising. The bridge deck features the well-appointed sky lounge leading out to a beautiful and intimate deck space. TIME FOR US offers multiple outdoor seating areas, including the expansive sundeck with Jacuzzi which provides a wonderful space to relax with uninterrupted 360 degree views while cruising or at rest. The refit in 2016 was extensive and every aspect of the yacht was touched. The yacht was fully painted in late 2016 at the same time as her Quantum Zero Speed stabilizer were added. These stabilizers make an already excellent sea boat even more comfortable underway and at anchor and she now occupies a unique position amongst her sister ships and most other yachts of this size and vintage. New teak was also added and has been kept in immaculate shape. Please ask us for more detailed information on the extensive refit and upgrade work that has been completed in the last five years. TIME FOR US is a beautifully built yacht in stunning condition with many fantastic features. 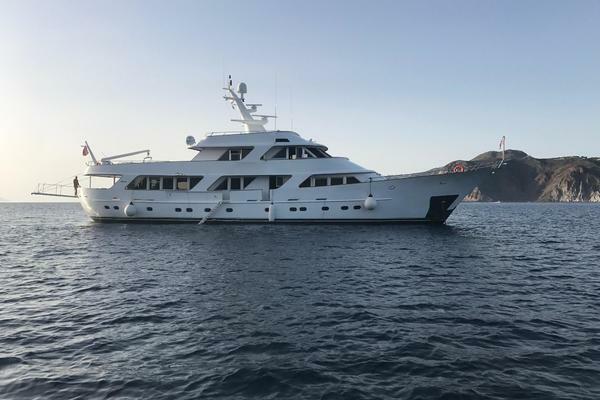 The owners have continually upgraded and maintained this yacht to the highest standards, but are ready for the next chapter in their yachting careers. We look forward to welcoming you onboard soon! United Yacht Sales New Jersey would love to guide you through a personal showing of this 121' Delta 1997. This yacht for sale is located in West Palm Beach , Florida and priced at $6,900,000. For a showing please contact us by filling out the form on this page and we will get back to you shortly!